﻿Hood Master Service will deliver the best and most comprehensive hood system cleaning. 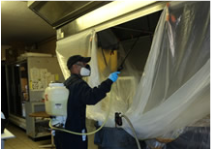 Our qualified technicians will remove the oil vapor deposits from the hood, filters, fan, grease cups, grease traps and duct leaving your hood system clean safe and in compliance with NFPA code. Upon your request, Hood Master Service will provide you with a free estimate. When you schedule a service appointment, our technicians will clean your entire hood system. Our technicians are trained to professionally remove the oil deposits form your hood system using specialized chemicals and equipment. They will take pictures of your system before and after the cleaning. Upon request, we will provide you with a report. Our technicians always wear the company uniform, and protective gear. "We take pride in our work! Give us a try, you will be satisfied with our work." If you don’t see your city in the list, please call us. Hood Master Service, LLC is an equal opportunity employer committed to a diverse and inclusive workforce. Hood Master Service is a drug free workplace. The unlawful manufacture, distribution, dispensing, possession or use of a controlled substance is prohibited and may result in dismissal. © 2018 Hood Master Service, All rights reserved.